This speaker bar is fantastic! The look of it blends right in with my other electronics. It looks smart and not cheap at all. I consider myself a bit of an audiophile. Music has been important to me my whole life. I respect it. I appreciate when the music sounds bright, crisp and full. The bass is excellent, though not so extreme that the sound bar crackles or shakes. It has a deep, rich tone and not the tinny and weak output from many units. The pairing is simply the easiest I’ve done. You merely turn the dial on the right-hand side, and it is ready for pairing. Turn on the Bluetooth function of your computer, phone or tablet, search for the speaker and choose it. That is it. I have several Bluetooth speakers, but this is the one I use every day. My daughter and I listen to music on it together when we are in the common rooms of the house. We control it then by either the living room computer or a tablet. Over the holiday, my brother-in-law came over and was visibly shocked by the sound that came out of this deceptively small bar. He assumed that it must have cost hundreds. At night sometimes I listen to music. I felt my bedroom Bluetooth speaker was a capable one for years. Realizing now how much better this one is, though, I use the JingXiGuoJi there. Sometimes I play music while bathing or showering. I had one of those shower wall speakers, but this blows that away, so it too has been unceremoniously replaced. I just take this with me from room to room to enjoy it everywhere. Why settle? I am looking forward to the nicer weather again and setting it on the porch to enjoy while getting some fresh air and sun. I highly recommend this speaker. I cannot get over how long this JingXiGuoJi NFC speaker lasts between charges. It has never quit on me, though I only think to charge it once in a great while. My only concern is that it stands up to all the use it gets and keeps on going for many years to come. I am extraordinarily happy with it. Here is my original Amazon Review. Look at the Amazon product page if you are interested here. I love a good quality double-walled borosilicate glass. 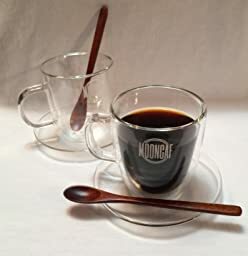 I use this sort of glass especially for coffee or tea, which I have daily. By the way, these are full coffee cups rather than the smaller espresso size. The “floating” drink illusion is cool to me. I have had borosilicate glass sets before. None had saucers or the spoons before. I love that this set has these great additions. Sadly, we had double-walled glasses before that both my daughter and I accidentally broke by stirring with stainless steel spoons. These Chinese cherry wood spoons will prevent that from happening again. The double-walled glass keeps condensation from forming on the cups and protects your hands from extreme temperatures, either hot or cold. I think they are elegant and fun at the same time. It is important to remember that the glasses are somewhat delicate. As such, I wash them by hand. I want to use these glasses for as long as possible. These are so thin that I am worried about how long they will last. I received this product at a discount to test and write an honest, unbiased review. You can get these beautiful Mooncaf mugs here. 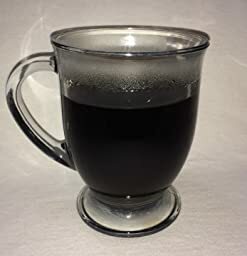 By the way, these are still going strong despite using them probably 4-5 times a week, as they are my favorite coffee cups. This Chosen Bean coffee is a single-origin, Sumatra medium-roasted coffee. It is 100% Arabica. This package is 12 oz. The directions call for 1-2 tablespoons per 6 oz cup. 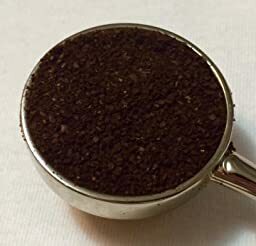 In my 34 oz French press, I tend to use 4 – 4 ½ tablespoons. This coffee required more than the standard. I most often choose the whole bean, but this tasted fresh, too. The grind worked perfectly for the French press. There were no more grounds than when I grind my own specifically for the press. I liked this coffee, but it was not amazing to me like some I have had lately. It had good complexity for me, but the notes did not come to a cohesive finish. The sweet chocolate touch does come through. An added note: the bag suggests to wet the grounds slightly before brewing. I did not notice this the first time I brewed it, but later pots-full were significantly improved. 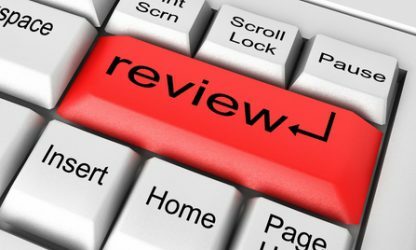 I received this product at a discount to test and write an honest, unbiased review. Chosen Bean coffee is here on Amazon. What is your coffee preference? Trusource Protein [Infused] Water has an excellent amount of protein– 20g in a 16 oz bottle. I tried the Fruit Passion flavor. The taste is fruity and reminiscent of a kid’s sweet drink to me. I am not used to artificial sweeteners, however, so that is a factor. I diluted it a bit with cold water and with some ice, and it tasted much better. Due in part to the dilution, I have had the Fruit Passion Protein Water in three stages rather than all at once. I like that, as it is a better value when it lasts three times as long for me. It is important to mention that milk is an ingredient as some people are lactose-intolerant. I liked trying this product. My suggestion would be to come up with a version without anything artificial and without milk so that everyone can enjoy it to get extra hydration and protein into their diet. This review will not have spoilers, nor will it say much about what transpires at all, in fact. I do not want to detract from it in that way. This review will merely state how I read it to the end. In truth, I was not going to review this book at all or, if I ever did, not this soon. I am still marinating in it, or it is marinating in me. I am not sure. Thinking of it just today, and how a few weeks have gone by, I became curious about how others saw it. Did many feel likewise moved as I was after having read it? “What is the problem here?” I took my glasses off and rubbed at my eyes, mulling it over. I looked over at my daughter. Seeing her brought my husband to mind. The similarities in them will do that sometimes. He passed on years ago, yet he gave me a “eureka” moment as though he was right there. He had not been a reader. Movies were his reading preference. Being dyslexic, I suppose that was fortuitous. Years ago, as craziness erupted on the big screen within the first few moments of the film, my husband whispered excitedly to our daughters: “Fasten your seatbelts, we’re in for a bumpy ride!” He knew right off he would enjoy the heck out of the movie if he just held on till the end– and just experienced it. He wanted them to do the same to get the full effect of the rush of free-falling. I realized my modus operandi as the reader needed to change or this was not going to end well– if I even finished at all! I am too stubborn to admit defeat that quickly, trust me! I took a few deep breaths and vowed to go for the experience and to ebb and flow to the beat of the author’s stream-of-consciousness. It turns out; it is a ride, indeed! 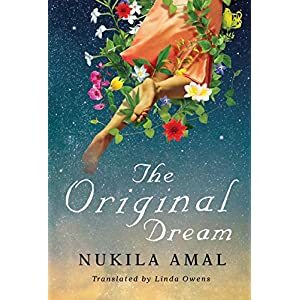 Nukila Amal’s is a metaphorical and poetic treatment of prose in The Original Dream. It is not your usual read; it is true. If you prefer your narrative simple and straight, then you may go away utterly disappointed like some rich young ruler in the Bible– or as I nearly had done. However, if you are in it for the adventure of reading, of being translated elsewhere and altering your perspective on the turn of a dime, then this alley is one you want to meander down to see where it leads. This journey will prove the path less traveled by, but the lack of footsteps that trod it before does not imply it is barren or desolate. It is lush and rich with ideas as well as overgrown vegetation. The patient reader will prevail still. It has made all the difference– just as Robert Frost promised. If you want to pick up The Original Dream, it can be found on Amazon here. It is available as a selection from Kindle First for the month of December 2016. It becomes available on January 1, 2017 for everyone. ~GROUPON COUPONS ~ $avings on Gifts! This post is sponsored. However, all opinions are genuinely mine. I have used Groupon Coupons for years, so it is about time I give credit where it is due. Before my husband passed away, I discovered the site and was delighted with the savings we accumulated with them. The coupons made it possible for our family to afford purchases that were otherwise not possible. Now, since he has passed on, it is even more vital that I keep to a very strict budget. I use Groupon more than ever to help me make ends meet. I still love to give, however. Despite the drop in disposable income, you can bet I do not want to stop now. That is why I check the Groupon site, including Groupon Coupons, often. There is always something new! Often I find exactly the gift I am looking for at a deep, deep discount. Since I have moved away from my hometown, I give some gifts to loved ones some distance away. One of the things I so enjoy myself is personalized gifts. I try to follow the adage that the best gifts are those you would love to receive yourself. I adore Things Remembered. I have fond memories of shopping the store before I moved from New York. Now that the locations are inaccessible to me, I am thrilled that I can buy online and gift-away from the comfort of my home. Groupon Coupons offers that have come in handy recently are 20% off with free shipping and 50% off! The other thing I love to gift is flowers. There are so many occasions that they are stellar for– birthdays, Mother’s Day, Sweetest Day, and Valentine’s Day, etc. Who doesn’t smile when they receive them? I have trusted From You Flowers for a few decades to send the perfect bouquet to express my sentiments of compassion, congratulations, and friendship. Groupon Coupons has had offers lately of up to 50% off of roses and flowers and 15% savings on fruit, spa, and wine gift baskets. “Work smarter; not harder” is true to form, so too it works here. I shop smarter with Groupon Coupons. If you haven’t tried it, do yourself a favor and give it a try. If it’s been a while, you might want to check it and see what kind of discounts you might have racked up. There are certain to be coupons for the vast majority of stores and businesses you already enjoy. How has Groupon Coupons saved you money?